It amazes me that when you are running for the President of the United States, that you could be so brainless when it comes to your campaign. 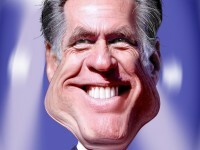 Did Mitt Romney seriously say that comment about the 47 percent of people that don’t pay taxes? Now I’m no politician or PR guy, but c’mon man. Whoever is advising him needs to really be on the hot seat for allowing him to go down that route. I think it is plain ignorance more than anything. I liked how President Obama responded and say that when you are running for President, you run for everyone and not just some. That was a softball that Romney through up in Obama’s favor. Too easy in my book. Fall isn’t technically upon us, but it might as well be. Nights are cold now (cold meaning in the 40s) which I’m not ready for yet to be honest. I love this time of year, but for whatever reason I’m still thinking I should be able to don shorts and a t-shirt at all times. Not so much. Last night I had to go outside and bring a couple of things in from the deck and it hit me like a ton of bricks. So the Pirates are officially annoying the hell out of me now. For them to come so close and then have this epic fallout is so disheartening. I’ve watched for 20 years since their last winning season and they teased me ONCE AGAIN this summer by actually thinking they’ve turned the corner. Then they go and have lost about 100 of the past 101 games it seems like. Last night against the Brewers, who like a month ago were completely out of the mix, they get shut out. My wife still yells at me for watching them – I think it an addiction. A bad addiction obviously. So close once again, and yet it looks like my heart is going to be broken again. It is suppose to be a nice day here in Western Pennsylvania so I’m going to enjoy it while I can, and while the little princess is at preschool this morning.